On this 4th of July, I'd like to put out a call for less billboards in City limits. Freedom from advertising! Freedom from corporate America shoving its message into my face constantly, unceasingly, undeterred. I know that Portland has a limit, and I think that limit's been reached, but to the rest of the state, how about some legislation that limits billboards - from highways, from byways, here and there, near and far, I would not eat it in a box, I would not eat it with a fox - enough already!!! We could put an excise tax on outdoor advertising revenue -- you know, x% of the revenue from the transaction. Just make the tax rate dependent on the size of the advertising surface and tax the party that sells the advertising. A small surface (20 square feet or less) could be tax-exempt, 20 to 30 square feet would be subject to a 2% tax, 30 to 40 square feet a 4% tax, and so forth. No upper limit: outdoor advertising above a certain size might be subject to an excise tax in excess of 100%, making it completely unprofitable to cover the wall of your building with an advertisement. This doesn't run into any free-speech problems with the constitution, since the state would be taxing revenue from an economic transaction, without regard to the content of what's put on a billboard or a wall. This also would eliminate the regulatory problem distinguishing between advertising and murals: parties sell billboard or wall space for advertising, but nobody sells space to put up a mural. If anything, the owner of a building might pay someone to paint a mural -- which would not be subject to the tax, since money isn't flowing to the building owner. Basically, this would allow the owner of a billboard or building to put anything up they wanted, tax-free. Want to paint an advertisement for your business over the entire wall of your building? Help yourself. But a truly confiscatory tax rate could restrict outdoor advertising to small wall signs and bus benches, and shut down all but the most lucrative billboards in the state. And yes: this is, quite intentionally, the government using the power of taxation to choke a disfavored business right out of the market. 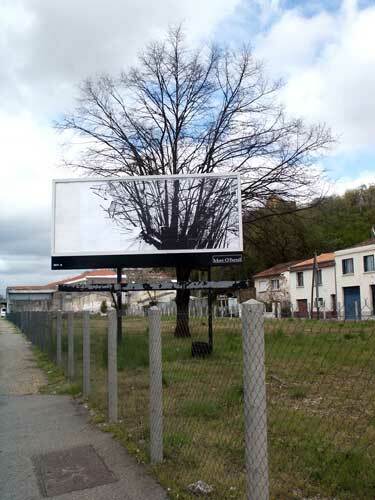 Outdoor advertising is visual pollution. We shouldn't have to tolerate it. Yea, it's something else driving down Hwy 26 east now and seeing those two signs near Boring. It's just very obvious the signs don't belong there. So we gonna restrict someone's freedom to advertise on July 4th no less? Do you people ever go anywhere else? Do you have a clue what it looks like in places that don't significantly restrict billboards? Not like it looks in Oregon, that's for sure. Oregon has had a law significantly restricting billboards for decades. Some provisions of it were ruled unconstitutional last year by Oregon courts on free speech grounds--I don't know where it's gone since then, does anyone here know? Total support here. I drove across Canada a few years ago rather than taking I-90; I just wanted to be a little less assaulted with the omnipresent 50 foot brightly colored artifacts of metastatic capitalism. It's amazing how much more restful one feels when one is allowed to actually focus on the country itself. Albert... Mayor Vera Katz waged war against the billboards in Portland - and, unfortunately, lost. Here's one story from WW. If I remember correctly, it came down to this: The Oregon Constitution's free-speech clause (which is much stronger than the US Constitution's) draws no distinction between political or artistic speech and commercial speech. So, if you bar billboards or commercial wall murals then you have to bar artistic wall murals, etc. Which isn't to say that more can't be done, zoning-wise, etc. I would think that, at least, the animated billboards are a traffic hazard due to their distractive nature. Has anything happened with those? Why the anti-advertising, anti-capitalist attitude? I really don't get it. A lot of billboards constitute irreplaceable advertising for small businesses and make a tremendous difference for them in sales, helping them provide jobs and take care of their families. This is proven with very sophisticated research. Would you let your personal feelings about corporations lead to you destroy the second-most effective advertising medium available to small businesses (the most effective being the on-premise sign, another frequent recipient of busy-body control freaks)? The only way to distinguish between small business ads and the corporate ads you apparently find so distasteful (despite their frequently clever designs) is content, and that is about as un-American as you can get. John Dunagan, I dare you to locate a single reputable study showing any traffic hazard whatsoever by any billboard or type of billboards. You can't because they are not a traffic hazard and studies have repeatedly demonstrated that they are not. In fact, many billboards offer directional information that helps drivers find what they are looking for, which increases safety. Just because your "common sense" says they are an unsafe distraction doesn't make it so. All the surveys ever done show that by a large margin the public, while not loving billboards, uses billboards and wants to keep them around. They also show that many businesses would have a much harder time making it - and some would fail - without billboards. Besides, it's downright arrogant to say one person's message is OK and another's isn't simply because one is trying to sell you McDonald's, another is trying to guide you to a local independantly owned motel, and another carries a public service message. Who are you to determine what messages someone else might want to say or read? It is an absolute fact that if billboards did not attract customers, the billboard companies would go out of business. You may not understand the level of sophisticated research that goes into the industry, but it far exceeds what most people would expect. And despite the high cost of leasing a billboard face, it is extremely economical and effective. Billboards are extremely valuable assets, so if you're so determined to cut off all the benefits they offer just so you don't have to look at them anymore, then you'd better also be willing to shell out some mighty big bucks to buy the things. You can't just take property away from people like that without paying for it. Finally, the reason anti-billboard fights fail over and over is because they are wrong on so many levels. Doretta, incidentally, is absolutely correct. We don't have a billboard problem in Oregon. You really do need to get out more. Thanks, Becky, that's why I asked. I'm glad nobody got their head slammed through a windshield because the person behind them was watching the moving pictures on the teevee facing the road! I guess the automakers are pretty stupid, too, for putting that screen with the DVD player and the Xbox hookup in the back where only the kids can see it. God knows the breadwinners are in the front of the car; won't someone think of the missed advertising revenue? Down with billboards! No more advertising! Stop the corporations! I hate those damned corporations and all the freaking jobs and money they provide. Damn you, corporations! This is all Haliburton's fault! I live on this earth. It's my planet, too. I share it with you. I generally try not to do things that infringe your enjoyment of this planet - like taking all of the resources away, or blaring loud music in your face, or running over you with my car. To me billboards are someone (in this case the combination of an organized group of people - a corporation - paying another someone, in this case a group of people - an advertising corporation) taking up public space so that they can put their message before me. This happens in thousands of ways every day, of course, but I think Billboards are the most egregious. If they don't bug you, then I salute you. But can't you also support those of us who are bothered by them? If I find KPOJ's awful advertisement which just shouts out its call letters at Burnside and 12th a blight on our urban house, can't you empathize and try to understand why it might bother me? Personally, I'd rather see a small garden and bench at that spot, rather than a 40-foot wide plastering of white background and red call letters - even though I like the station - their advertising is lame. Who else is taking up ground level advertising space right now? The Oregon Beef Council with their ads that say "We love vegetarians, means more beef for us" which I think is insulting and it's right there in my face. And, you say this is to benefit the small businesspeople? Well, let's say I'd like to put up a billboard that sits in front of the Oregon Beef Council's office that calls them assholes for their annoying message in the heart of probably the most vegetarian per capita city in the country? You think I'd be allowed to do that? Not on your life. So, it's not an even playing field, at all. Something needs to be done at least about the at street level billboards, they are obnoxious and I think we could get rid of them. If not, I encourage anyone with a spray paint or paint in a water balloon to get out there and get busy. Adbusters has a lot of great info on this, btw. Not just on why it's wrong, but on what to do about it. Yes, we do share this planet. That means you have to put up with things you don't like just as others have to put up with things they don't like so that everyone can express themselves as guaranteed by the First Amendment. Your blaring music analogy doesn't hold water because speech of all kinds already can be regulated as to time, place and manner - including volume, or in the case of signs, size, height, placement, and illumination. But not message. And you can't take a sign that was legally permitted at the time it was erected without paying just compensation for it. So if you don't like a particular billboard, go talk to the property owner that's leasing the space to the billboard company and find out what it would cost to convince them not to renew the lease, and then go to the billboard company and see what it would cost you to work things out with them. can't you also support those of us who are bothered by them ... Personally, I'd rather see a small garden and bench at that spot, rather than a 40-foot wide plastering of white background and red call letters - even though I like the station - their advertising is lame. I can empathize and even agree with you all day long, but the fact is it isn't up to you or me to decide whether we "like" their speech or not. If you want to be able to put up a sign saying "Make love not war," which some people find extremely offensive, for example, you have to be willing to let someone else say, "listen to my radio station." Furthermore, you cannot tell someone else that they must have a garden on their property instead of a sign when the sign is allowed by law, no matter how much you might prefer to look at the garden. Your argument is as silly as my saying that because my kids are allergic to grass and are made very uncomfortable by it, people shouldn't be allowed to have lawns or because I can't stand the color yellow nobody around me should be able to paint their house yellow - only it's worse because you're wanting to dictate the form of someone's speech, which is protected far more under the Constitution than lawns and house paint. We all have to accommodate each other's rights, and speech most of all. If you are willing to pay the value of the legal sign to have it removed, then you can probably find a way to do that, provided your pockets are deep enough because signs are very valuable. let's say I'd like to put up a billboard that sits in front of the Oregon Beef Council's office that calls them assholes ...You think I'd be allowed to do that? Not on your life. If you were not allowed to do put up a sign expressing disagreement with the Oregon Beff Council (minus the expletive), but someone else could put up a "Got Milk?" sign there, for example, you would have a solid case to go to court. That is completely illegal and not only could you recover attorney fees (meaning a First Amendment lawyer could probably be found to work on a contingency basis), you could also win damages for civil rights infringement. This is not a new subject matter - it's been decided repeatedly and therefore the Courts really frown on it. I encourage anyone with a spray paint or paint in a water balloon to get out there and get busy. Vandalism of private property is flat wrong and you ought to be ashamed of yourself for suggesting it. Public billboard advertising is a blight no matter who does it. Lady Bird was right on, and our interstate system is still the better for it. I don't make any distinction on content; it should all simply be banned based on size and perhaps proximity to the business doing the advertising. They may be effective, but business survives just fine without them--given that we have fewer of them in this state, and our economy is not under threat of collapse. We could get rid of them all tomorrow if we were willing to pay for them. This is why I propose taxing the revenue from an advertising sale rather than regulating the content. Allow someone to paint a mural, you pay no tax because you collect no money. Sell advertising space on your wall, you pay a tax -- potentially a huge tax if the image is large enough. No need to draw distinctions between commercial murals and artistic murals; money changing hands will take care of that. Becky: "If you want to be able to put up a sign saying "Make love not war," which some people find extremely offensive, for example, you have to be willing to let someone else say, "listen to my radio station." What I'd like to suggest is a program that exists in Seattle - each year citizens get to suggest one billboard for removal. That way the number continues to go down and you get rid of some of the worst offenders. If you were not allowed to do put up a sign expressing disagreement with the Oregon Beef Council (minus the expletive), but someone else could put up a "Got Milk?" sign there, for example, you would have a solid case to go to court. That is completely illegal and not only could you recover attorney fees (meaning a First Amendment lawyer could probably be found to work on a contingency basis), you could also win damages for civil rights infringement. This is not a new subject matter - it's been decided repeatedly and therefore the Courts really frown on it. Not sure what planet you are living on. Please have a look at Adbusters site for lots of experience they have had with trying to run anthing anti-corporate on TV, on billboards or in magazines. No dice. Me:I encourage anyone with a spray paint or paint in a water balloon to get out there and get busy. Becky: Vandalism of private property is flat wrong and you ought to be ashamed of yourself for suggesting it. Curious what your take on the Boston Tea Party is? I believe that we're currently at war on corporate America. And if we're not, we should be. Wal-Mart and friends are basically reducing this planet to a very hot and polluted place. We can be nice, or we can get to work and revolt. and the courts, well, they're not prooving too helpful these days (see Libby sentence commutation, for example...) I don't feel great suggesting spraypaint on billboards, but in this case, seems like one option to get the point across.